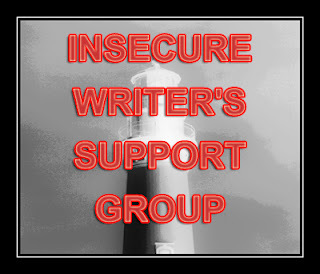 This months Insecure Writer's Support Group post (group brought to you by the fantastic Alex J Cavanaugh) is all about my insecurities of not being able to complete my goals like I want to. I haven't been doing completely terrible with my goals, but I haven't been doing very great with them either. Critiques are going okay, writing is going about the pace of a snail, and reading is going even slower than that-as in not going at all. I've been an insecure writer for months now, I want to have a post that is full of wonderful things. That post may not be today, but I know it's coming soon. Until then, I'm critiquing and working on finding my writing mojo again. Reading will come when the critiquing and writing flows easier. It's hard for me to focus on reading when I'm feeling like I haven't been productive enough. Oh and one last thing, an update for those of you who read my post about the bracelet...I talked to the awesomely wonderful Ali Cross and she said she will send me a new one (a couple actually). Yay! So, that's my ISWG post for this month. Insecurities want to take control, but I won't let them. I will make it through very soon. Hopefully the critiquing will inspire you. Glad Ali is sending you some new bracelets. She's awesome that way. And you get an eHug. \O/ We all hit that slump. I was talking about it in December and still clawing my way out, and I agree with Alex. The critiquing may help inspire you. Tomorrow is another day, and usually a better day! Things will change and change and change. Go for a walk and seek inspiration in the sunshine. Don't worry :) Just have fun!